With the holidays coming up fast it’s easy to get caught up in all the planning and prep for dinner parties, out-of-town guests, shopping, etc. While I think all of that chaos is fun, I also know that it’s important to stop and think about the real meaning of the holiday season and I always make sure we do something charitable as a family to support those in need. My boys and I have been donating to a specific charity over the years that collects shoe boxes filled with gifts for children all around the world. By doing this they get a better understanding of the meaning of giving and helping others who are not as fortunate as we are. Whenever I get the chance to include my boys in an act of charity, I do. I think it gives them a sense of pride to be able to help, and I hope that the spirit of giving stays with them throughout their life. To help parents teach their young ones about giving to those in need, the founders of Play.Create.Grow. 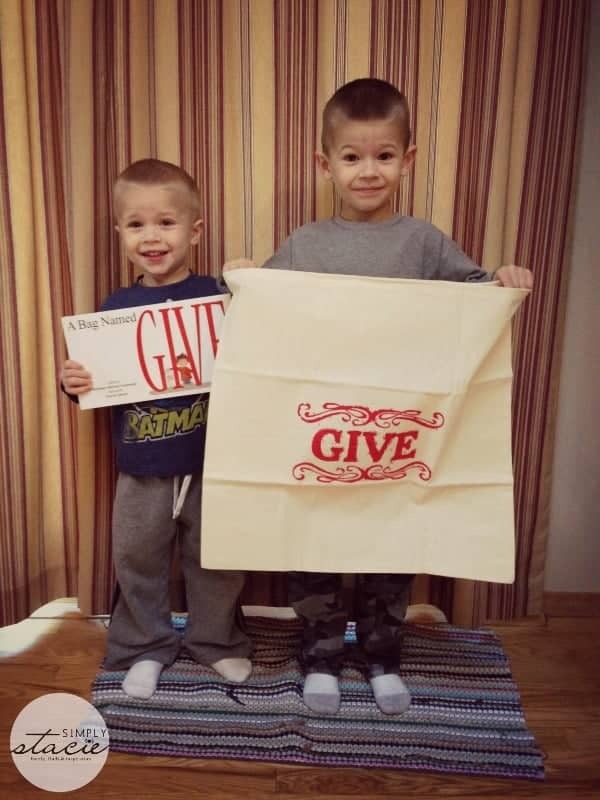 have created a neat way to start a new holiday tradition of giving with A Bag Named GIVE. 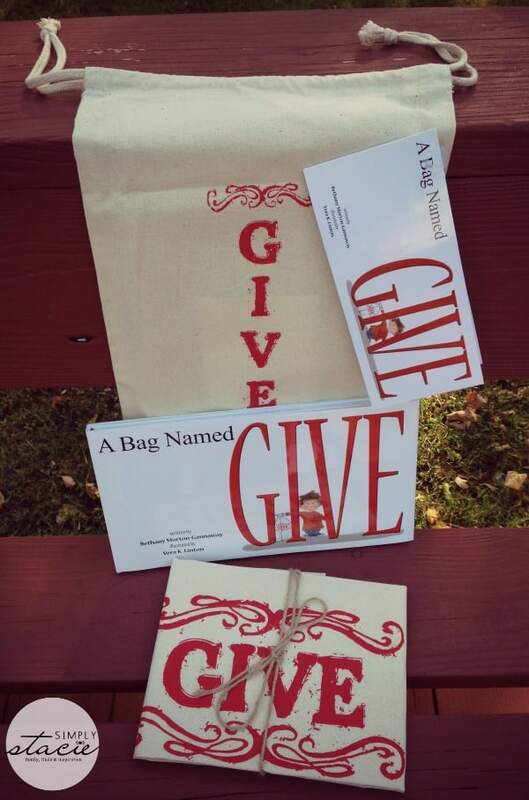 When you order A Bag Named GIVE you receive a hardcover story book, a 20″x20″ muslin bag stamped “GIVE” for placing your donations, as well as a 10″x16″ stamped keepsake bag to store the book and giving bag. The concept is simple – first you and your child pick out a few toys that they feel they can part with for giving to children in need. Next, you load up the giving bag with the toys and leave the bag under the tree on Christmas Eve. Then when Santa visits your house, he takes the toys in the bag back to the North Pole so that the elves can polish them up and give them to other children (or so the children will think!). The parents role is to take the toys out of the bag when the children are asleep and put them in a safe hiding place to take to Goodwill or other local charities. What’s left behind on Christmas morning is the empty giving bag and a thank you note from Santa (which you can download right on the Play.Create.Grow. site). The book is an easy and quick read that went through the above steps, and both of my boys “got it” – they were excited to go through their toys to see what they could stuff in the bag give to other children. I love that my boys have big hearts and this book and new tradition is really keeping that love alive! Once the tree goes up after Thanksgiving, we’ll place our bag under the tree for Santa. This is a great way to start a new tradition in your home and a great way to involve children in a charitable act. This kit sells for $30 on the Play.Create.Grow. site. The Play.Create.Grow. vision as a company is to inspire children through play. They design and produce children’s books and play kits that inspire creativity and encourage children to use their imaginations to dream big. Their products would make for unique and fun holiday gifts for the children in your life. To see all that Play.Create.Grow. has to offer, check out their website. You can also find them on Facebook, Twitter, and their blog. i love the cootie catcher for halloween. I like the Bug Soup Chef Kit! I like the Magical Mailbox. I love the magical mailbox for my niece! Would be a great teaching tool for my grandchildren. I like the Bug Soup Chef Kit. I like the Jellipops & Lollibeans: the Magic of Easter Eve. The Bug Soup Chef Kit seems neat. I adore the magical mailbox. I liked the Owl Snack Time Recipe.